...Scale Down, Windsor: So, it's proof you want, is it? So, it's proof you want, is it? At a recent family get together, Uncle John (his real name) was trying to talk my partner and I into moving our whole family down to Phoenix, Arizona and open a coffee shop with him. Apparently, the downtown core of Phoenix is positively booming and the lineups for a Starbucks is out the door and around the corner. It's not that we are necessarily top notch Barista entrepreneurs - we're not. He just likes having his family near by. You've gotta like the guy! Now, I'm not writing to you to aire my consistantly tough decisions (but if council doesn't do something to make downtown life here in Windsor better, I'll be Phoenix bound! ), but to let you in on exactly why Phoenix is at the point where it is. In Uncle John's attempts to lure us to the land of 110-degrees-in-the-shade sunshine, we occasionally get emails from him with certain attachments that make us question why we're still in Windsor. 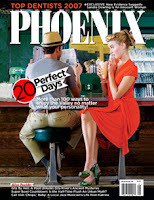 Read this article he sent us from the October, '07 issue of Phoenix Magazine and you will learn that the impetus to this downtown revitalization is eerily familiar to Windsorites, and not just because you've read a bit about it here before. According to Phoenix City Councilman Michael Johnson, the big focus on their downtown started, ironically, with the failed effort to lure the Cardinals football stadium. "We weren't able to get the stadium, but as a result we ended up purchasing a lot of property, which became necessary when we started looking at ASU and the biotech campus". I don't think I need to say any more. Now - call your councillor and ask him/her why we're sitting on this Downtown University Campus idea. Some of them need you to spell it out for them. What more proof do they need? Posted by Chris Holt at 12:10 p.m.
Yeah - sounds like a tough decision - RUN TO PHOENIX!!!!! Don't say I never did anything for you! September 24, 2007 at 4:11 p.m. I second that motion. Phoenix 2 Windsor 0. September 25, 2007 at 8:50 a.m.
September 25, 2007 at 9:14 a.m.
Phoenix is economically vibrant perhaps, but as a livalbe, sustainable city, it's a magnification of all of Windsor's problems with sprawl and car-driven urban design. Moving there would be like giving up on everything you've ever posted on this blog. September 25, 2007 at 9:54 a.m. Besides, it's in the US, and - US readers please don't take offence - I kinda like it here in Canada. I can't think of another country I would want to live and raise my family, high taxes and all. So Windsor will have to deal with me trying to make it better. Sorry Eddie! September 25, 2007 at 10:26 a.m.
Phoenix has many problems. Ever try to drive around there? They're rated one of the worst in the country for drive times because of their sprawl. Phoenix is a soulless city that is redeveloping their downtown because late in the game they realized its importance. Scottsdale is already creating their own artificial downtown with a shopping mall designed to lure residential. If you had to go, go to sedona. Paradise on earth. September 25, 2007 at 3:19 p.m. I don't want to be a complainer, but Sedona, super beautiful, but awful place! All those middle-aged hippies and their crystals and vortexs sailing around in SUVs. Souless indeed! September 26, 2007 at 11:51 a.m.